Answer the following questions using the applet. 1. Can you make a quadrilateral of four sides being 2 cm, 3 cm, 3 cm and 9 cm? Why or why not? 2. If a quadrilateral has four equal sides, what are its possible shapes? 3. 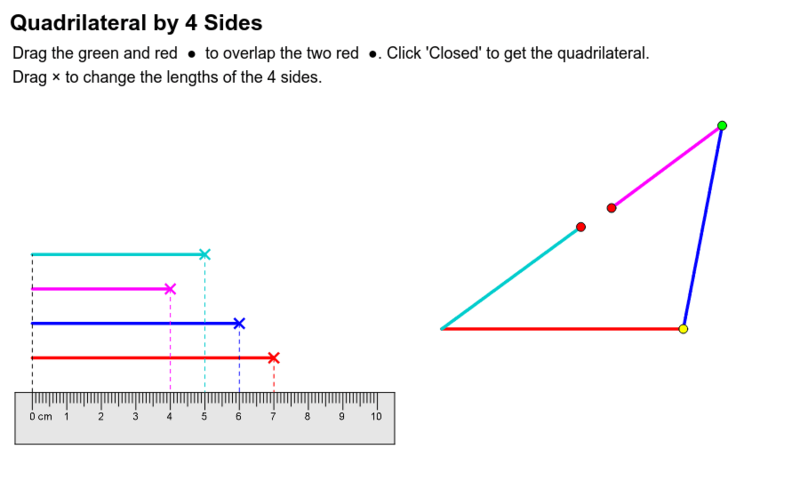 If a quadrilateral has two pairs of equal opposite sides, what are its possible shapes? 4. If a quadrilateral has two pairs of equal adjacent sides, what is its shape? 5. Make the trapezium of the four sides (from top to bottom) being: (a) 4 cm, 4 cm, 4 cm, 6 cm;　(b) 4 cm, 4 cm, 5 cm, 6 cm; (c) 4 cm, 3 cm, 5 cm, 7 cm;　(d) 3 cm, 3 cm, 5 cm, 7 cm. What is the characteristic of trapeziums?